The forthcoming Phon.o album „Burn down the town“ is gonna be like a mixtape a la booty karaoke and promises a permissive mess on record. Yet still before that the 12’’ “Trick or Treat” will be released which features well-known artists along with Carsten Aermes aka. Phon.o. Never was groove’n’base so plumped up, rarely was hiphop so ankletish. 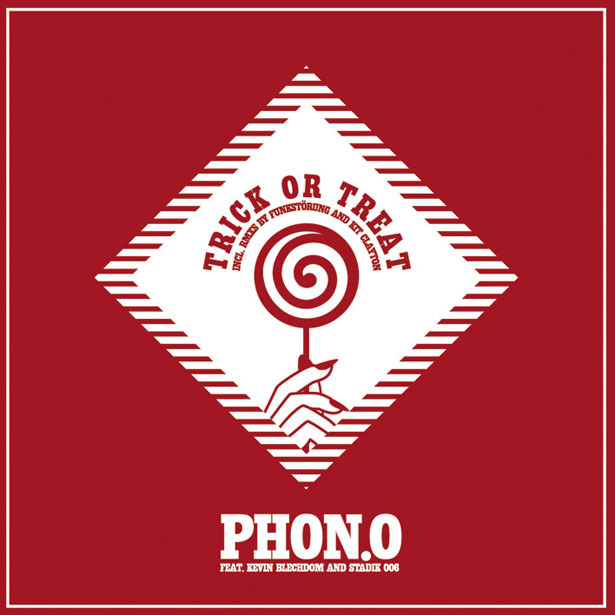 “Trick or Treat” is Phon.o and Kevin ‘just don’t bust my bladder’ Blechdom's answer to 50Cent in the candy shop. This may already be a hit for Halloween, and this song should be mentioned in one breath with the foot stank of Usher, Timbaland and the Neptunes, whereas Kevin Blechdom smells more like Missy Elliott and Destiny's Child. Four years ago an American named Kevin Blechdom moved to Berlin in order to study “German genitalia”. The funk comes from Funkstörung: their remix of “Trick or Treat” bears traceable elements of this tolerant music style around the groundwork of Kevin Blechdom. Here the famous Italo-Bavarian combo shows a brilliant finger technique and seems a little shy to force the lust of the singer shamelessly and slaphappy to go all haywire. ‘Hoes ova Bros’ – such rhymes make ghetto-tech drop its underpants, and that’s what “Busted in da D.” is supposed to do. Phon.o twists the words of a white thrash dude from Detroit named Sadik006 who remains unpunished. Big surprise that the beast from San Francisco Kit Clayton himself puts his hands on a remix even though he vowed to never make music again. Apart from having a rarity bonus, this piece is as superior as you can expect it from the most intelligent person in the never ever dying out world of rave music. To sum things up one should say, that with such good music, Phon.o ought to be granted great success, which is indisputably required if the horny young man from East Germany wants to sell records. True Dat.